Molecey’s Mill is one of the buildings in West Deeping closely associated with the Stamford to Deeping Canal. From the village of West Deeping, going downstream, the route of the canal passed directly in front of this former watermill. Compared with other parts of the canal that are still visible in the 21st Century, this stretch looks the most like the canal would have done over 150 years ago. We refer to it locally as Molecey or Molecey’s Mill, the name under which it is listed by Historic England – for several generations the Molecey family owned the mill and surrounding land during the 18th and 19th centuries. A date stone on the granary building is very clear – 1773. But it is not clear whether this building replaced an earlier one on the same footprint. The house, to the west of the granary, is almost certainly of a later date. The property was divided into two in the 1980s – the ‘Granary’, converted for residential use, to the east; the house to the west. The western part of the property was renamed ‘The Water Mill’ by Mr and Mrs Fyfe when they bought it in 2009. Still in working order, the undershot water wheel is the only example in Lincolnshire of a design by 18th C. French engineer J.V.Poncelet. It can be seen from the rear of The Granary but the mill mechanism is in the mill house. Was this mill here in 1571? Was it one of the 6 or 7 watermills that hindered the navigation of the River Welland and gave cause for the petition to Queen Elizabeth 1st to construct the canal? Was it here in 1620, when the Commissioners of Sewers described the route of the New Cut, intending to avoid all these mills? What evidence we have is open to interpretation! The Commissioners of Sewers did not list the offending mill sites, but their proposed route was from the eastern end of the village, running into an ‘old ditch dividing the fields of West Deeping’. (Unfortunately we do not have an old or detailed enough map to check exactly where this was.) The suggested route continues: ‘and a little lane leading to Market Deeping (now a footpath) until it come to the highway that leadeth from Tallington to Market Deeping (later the Morcott to Deeping Turnpike Road and now the A1175) and from thence on the south side of the said way to Market Deeping corn mill into the river Welland near the town’s end…’. (This is William Harrod’s transcription of the James I Welland Navigation Act in his 1785 publication History of Stamford). The site of this watermill is still identifiable, although the canal, formerly to the north of the mill, has been filled in and water diverted into the main river since the canal’s closure. A map of Deeping Fen, drawn in 1763 but surveyed nearly a hundred years earlier in 1670, is the earliest map we have found showing the eastern end of the navigation in sufficient detail to distinguish the canal from the river. But its greatest value is that it labels the sites of not one, but two mills to the west of Market Deeping – ‘Thorp’s Mills’ and ‘Mr Sharp’s Mill’. This second mill is thought to be the West Deeping mill, later to be known as Molecey’s Mill. The scale of the map and the possibility of inaccurate labelling leads to some doubt – ‘Mr Sharp’s Mill’ is written nearer to the southern branch of the River Welland, with Lambs Close (Lammas Close) and the canal lock marked to the north. So, possibly, the map shows an earlier building, further south on the main course of the River Welland, rather than the present site. Considerable effort has gone into tracing Mr Sharp or Sharpe, a miller or perhaps just a mill owner. We do not know whether the name was used in 1670 when the area was surveyed, or in 1763 when this map was published! By the 19th century there were many Sharps in the Deepings, a solicitor, a maltster and brewer, a draper … obviously descendants of 17th and 18th century families. A reference in 1739 to a maltster, Jeremiah Sharpe seems a possibility, and we know from nineteenth century records that Thomas Sharpe’s brewery was in the Market Place, to the north of High Street, Market Deeping. He died in 1839, so it is possible that he or an earlier relative could have owned or been a tenant of the West Deeping mill on Stamford Road. The 19th century Thomas Sharpe was certainly interested in the navigability of the Welland as he attended a meeting in Spalding in 1836 called to urge the Welland Trustees to act on the recommendations of Walker’s report on improving the Welland navigation. We would like to think that the initials ‘TS’ (the ‘S’ is backwards) carved on a beam in the granary are those of Thomas Sharp back in the 1700s before the map was drawn! There are several references in parish records and national archives to John Molecey. One of the earliest is a reference in the Manorial Court Rolls for 1747, to John Molecey, a “whittawer” of Market Deeping. A “tawer” was a leather-worker, and a whittawer is someone who works leather using alum and salt rather than tannin, to produce a white leather. It was applied to the occupation of glovemaking, but was also the name for a harness, collar or saddle maker by the 18th century. In 1748 John Molecey of Market Deeping took on two apprentices, each described as ‘a poor child of the parish’ Henry and John Parish, sons of Richard Parish, ‘in the occupation or business of Husbandry‘. Presumably this was John Molecey the elder, because another reference for 1747 is to John, son of John Molecey, in a register of duties paid for apprentices’ indentures. He was apprenticed to Gentell Chappel, a baker, of Pinchbeck. In 1756, it is presumably John Molecey Junior who is identified as a ‘Gingerbread B(aker).’ when he in turn takes on an apprentice, William Warner. His occupation tallies with the information from the will, dated 9th January 1780, of John Molecey of Market Deeping, in which he described himself as ‘Miller and Baker’. The initials inscribed on the 1773 date stone on the north facing gable of the granary next to the Mill House are ‘J’,’ E’, and ‘M’. Dates for the births and deaths of John and Eleanor Molecey make it reasonably certain that John was responsible for the building of the granary, although it seems he was living in Market Deeping both before and after this date. For more information about the Molecey family see also ‘From gingerbread to railways – the Moleceys and their Mill’. At the time the canal was in use, this area would probably have been much busier – with the traffic generated by the mill itself as well as goods being loaded or unloaded between lighters on the canal and carts or wagons on the Stamford to Deeping road. From 1761 the road was turnpiked and managed by the Deeping and Morcott Turnpike Trust with a toll bar and tollkeeper’s cottage only a few yards west of the mill buildings and just north of the canal lock. Toll Bar Cottage, Stamford Road. Now demolished. From a watercolour painted in the 1930s by Helen Witt, sister of the mill owner at the time. It has been suggested that tolls for the canal were collected by the turnpike toll keeper, but we have not found any documentary evidence for this. It is clear from the Enclosure Award map that in 1813 the mill was in the same place as it is now. The route of the ‘Navigation’, as it was labelled, came north-eastwards from the village, across the fields. It was more or less parallel with a watercourse which still remains and has been referred to on other old maps as the Mill Stream or, as on the modern Google map, the River Welland. The other, wider course of the Welland is further to the south; the two branches join again east of Molecey’s Mill. 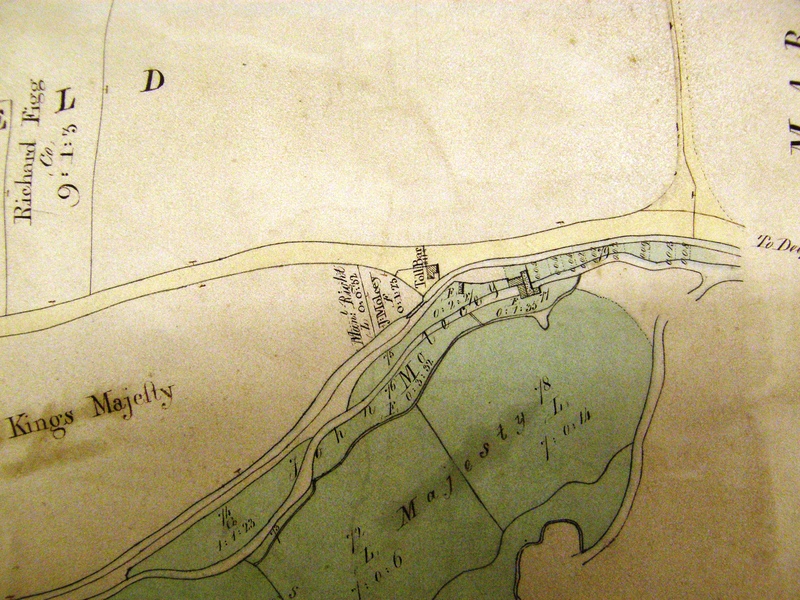 In this section of the map, the land to the south of the canal is shaded green on the original, indicating it was ‘ancient enclosure’, and much of it belonged to the Crown. It would appear that John Molecey already owned the land on which the mill stood. (For this reason, there is no mention of this piece of land or the mill in the text of the Enclosure award.) ‘Lammas Closes’, the land to the north of the Navigation, one of the village’s common fields, had been newly enclosed and allotted to the crown. The 1813 Enclosure Award map for West Deeping shows not only the toll bar, but also the canal lock, immediately south of the toll bar. The map also shows 9 very small plots of land (from 2 to 13 perches – a perch being about 25 square metres or 30 square yards) to the east of the mill buildings, lying between the canal and the mill stream to its south. The green shading denotes that they are “ancient inclosures” made before the 1813 enclosure of common lands. The “Reference to small pieces” on the map lists the owners – Joseph Rickett and Richard Figg had 2 each; Ann Rose, Frances Billings, Revd H Hyde, John Green and John Figg each had 1. They are all West Deeping landowners with varying size allotments elsewhere in the parish, but there is nothing to be found in the Enclosure Award itself that explains the history or the function of these strips near Molecey’s Mill, nor have we yet found any evidence in other documents. There is no trace of buildings here but it is possible that these local smallholders would use their designated plots for storing goods and transferring them from one waterway to the other. There are several questions about this. Why is there no convenient bridge from the turnpike road over the canal? Did the farmers load goods up on the east of the lock to avoid a toll going downstream? Did they use the river or the canal to go downstream? Did they not want to use the canal to go upstream to Stamford, in which case why did they not make arrangements to load goods in the village, nearer to their other allotments? Or were these allotments simply for the purpose of using the mill? The mill has had many owners about whom we know little apart from what the parish records and census information tells us, but we do know rather more about the Molecey family and in particular John Molecey Twigge Molecey, the owner in the mid 19th century when the canal’s working life was at an end. The Welland Navigation Committee Minutes for 10th May 1867 [BA8/22 image 1259] record the Corporation’s response. Their sarcasm about the problem of the duck weed and less-than-sympathetic attitude to Mr Molecey is all too obvious! Duckweed – still a problem! Life at Molecey’s Mill carried on even though the canal had stopped functioning.